Airstream has been building and selling recreational vehicles for almost 100 years now. But recently, the iconic trailer manufacturer revealed that they’ve made an RV that is unlike anything they–or anyone else–has ever built. This new technology is expected to make it easier for those who use Airstream RVs to keep tabs on just about everything in their vehicles. 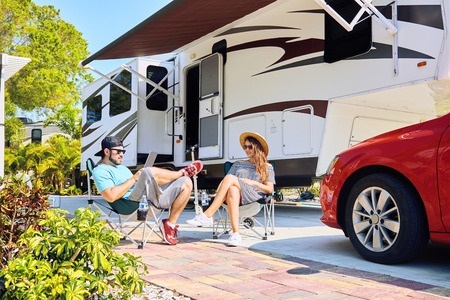 Thanks to Airstream’s Smart Control Technology, those who own a 2019 Classic will be able to connect to their RV and take control of it. They’ll be able to turn lights in the RV on and off. They’ll also be able to power up and power down fans. They’ll be able to check their propane and battery levels whenever they want. And they’ll even be able to access their awning and open it up or close it with the push of a button. The Smart Control Technology will also keep campers connected to others. It’ll provide people with a Wi-Fi boost and a 4G LTE modem that will make it simple to get in contact with anyone at a moment’s notice. Additionally, there is a GPS locator integrated into the Classic that will help people navigate back to it if they ever lose their way. It’s likely going to change the way people camp and interact with the great outdoors. Airstream likely won’t be the only RV company to take this step, either. With vehicles as a whole becoming more and more technologically advanced these days, it’s only a matter of time before other RV companies follow Airstream’s lead and work smart control systems of their own into their RVs. It’s going to revolutionize the industry and make camping–or “glamping,” as it’s sometimes called–more accessible to everyone. Hemet Valley RV welcomes the changes that are taking place in the RV industry. But we also take pride in our ability to deliver the same good old-fashioned customer service we always have. Whether you want to put new siding on an RV or you’re looking to store one, call us at 951-765-5075 today.